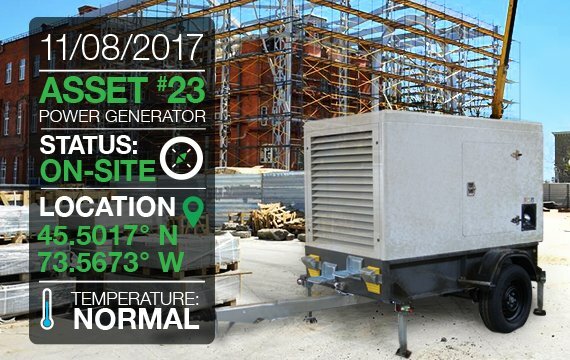 Companies operating job sites in remote areas rely on equipment such as generators, trailers and light towers to keep projects on track. However, it can be a challenge for project managers to monitor equipment in the field, and lack of visibility can result in unplanned emergency maintenance, project delays and even safety risks. Trakopolis is a cloud-based platform that integrates mobile communications, software applications and location-based services so you are always connected to your important equipment. Customer-driven development has enabled Trakopolis to offer industry specific solutions that are designed for reliable, long-term deployment. Trakopolis Equipment Monitoring solution is hardware agnostic and easily installed on important equipment, giving you real-time visibility into condition and status changes that could affect performance. Embedded sensors record everything from location and temperature to movement and tampering, with automatic alerts keeping you informed so you can take action quickly. Data from the sensors is transmitted via the cloud to Trakopolis’ user-friendly platform, where you can customize and run asset utilization reports that help determine optimal equipment use across sites, and help you make better business decisions overall. Optimize equipment usage, increase visibility and security, and improve operational efficiencies with Trakopolis Equipment Monitoring.